Despite the advent of downloadable music tracks, I am still a fan of albums. However, in this post I want to highlight some favorite songs that I've heard in recent years that stand up very well all on their own. It's highly likely that you'd be able to find these songs on one of the music download services (you know my current favorite). 1) "I Just Don't Think I'll Ever Get Over You" by Colin Hay from Men at Work fame. This is actually the song that made me decided to do a post like this. I've been listening to this song for a good long while now, and every time I hear it, it never fails to touch me. In fact, it's one of those rare songs that I try very hard not to interrupt once I've started to listen to it. It's a spare and intimate acoustic song with incredible sincerity. He's never explicit about what happened, and it is clear that he means what he says, but he's not singing to us. You have to hear it for yourself. If you go looking for this track, try to get the extended version from "Transcendental Highway" that's over 7 minutes long. There is a shorter track that contains the complete song, but the longer track has a little bonus ending that I really think adds something. [Update: Hmmm... Googling around for links and such has led me to discover that this song appears on the "Garden State" soundtrack. I haven't heard the soundtrack or watched the movie. So, I don't know what version of that song you'd get on that disc]. 2) "Won't Give In" by the Finn Brothers. I was initially exposed to this song by issue #14 of Paste Magazine. It was actually in the DVD. So, I first heard this song by watching their video. Normally, I prefer to hear a song before watching a video because videos often have nothing to do with the song and can forever taint the experience. But in this case, I think the video compliments the song nicely. I don't know how other people will feel about the song, but there's a sentiment expressed in the chorus that resonates strongly with my own experience. 3) "Fisherman's Blues" by The Waterboys - An achy fiddle, a lamenting mandolin, and some full throated singing (and some great hollerin'). It's the only song that's ever made me feel, even for a moment, that I might want to be a fisherman. Anyway, it's a great song that absolutely revels in its tragic ways. The version I have came from the "Good Will Hunting" soundtrack, but it looks like the song was the title track for an album. 4) "Wish You Well" by Bernard Fanning. This was a another Paste Magazine introduction from issue #25. This song is a very upbeat and pumping and seems to be about forgiving and moving on despite being hurt and rejected. Who can't use a good theme song for times like that? Anyway, if you aren't smiling, bopping around, and singing along to the chorus while you listen to it, I would consider looking for your misplaced soul. You can hear a version of the song in the player on his myspace page. 5) "Song No. 6" by Ane Brun (with Ron Sexsmith). This song was also on the sampler CD for issue #25 of Paste Magzine (that was a particularly good issue). This is one of those rare, sweet love songs that don't make you cringe when you listen to it. I think that's partly because there is a duo singing to one another. So, the love isn't unrequited within the song. Also, it's not all coos and sighs, but has clever lyrics. It's good fun with just enough sincerity to make it legit. Neat! You can also hear this song on her myspace page. This was fun for me. I might do this again. Maybe next time I'll try to make sure you can readily hear all the songs I'm talking about. I obviously enjoy the occasional comic strip. However, I no longer get my comics in the traditional, printed form. All the strips I read are accessible via the web like God intended. In fact, most of the strips I read aren't even syndicated. There's one in particular that started out syndicated but has since gone independent. I think the strip has actually become better since that change. Maybe that's just a coincidence, but I like to think that with the creator firmly in control of his creation that his creativity has been let loose. Anyway, the strip I'm talking about is Sheldon by Dave Kellett. In particular, if you are a Star Trek fan, check out this strip and the next one. Hey! His site has a feed. So, if you already use a feed reader, you can just subscribe to his feed and never miss a day. Just in case you thought this post was a joke, I provide you with photographic evidence that it is not. This is a picture of what my bumper used to look like. As you can see, it bears the mark of the previous owner's declaration of fealty to a hospital in New Mexico. After some application of razor blades and rubbing alcohol, I managed to clear away the remains of that old sticker. In its place I give you the Earth Nativist Movement sticker. I'm once again delivering stale music news, but just in case you hadn't heard, Paul McCartney (Sir Paul McCartney?) has a new album called "Memory Almost Full". I haven't listened to it yet. However, I already consider it notable for one reason. The album is available on emusic. It might also be available for download elsewhere, but emusic provides DRM free mp3s. If an "old" school dude like McCartney can get on board with providing his music in customer friendly formats, I think that's a positive sign for the music industry as a whole. Hopefully it will pan out monetarily for him. Maybe this event is more psychologically significant than actually significant, but it just seems like an indicator of the way things are going in the music world. You know, finally giving customers what they want. Yay! I'm sure you've been waiting for this with bated breath: more progress photos. 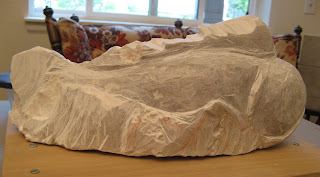 After working that clay into a form roughly like the stone, I proceeded to carve out something similar to what I have in mind for the final sculpture. This isn't exactly what I'm going for, but it is close enough. I seem to be drawn to the more stylized renderings. I don't know if it is because of time constaints or if it is just what I'm interested in. Probably both. 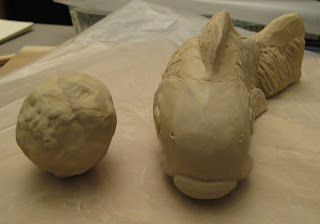 You'll notice the little blobs of my quick attempts at suggesting water plants on the sides of the fish. I'm thinking about doing that for two reasons. One, I want a solid base for the sculpture to stand up. (This may not be a big deal as the sculpture forms a pretty solid three point stand they way it curves.) Two, I'm a little worried about making the sculpture too thin towards the back end. I'm still pretty new at this stuff. So, we'll see what happens. And in case you doubt my working method with the clay. 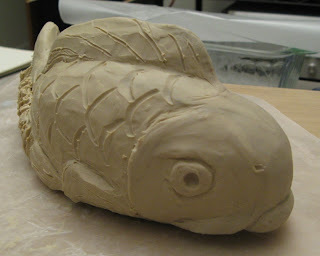 Here's a picture of the fish along side all the clay that I removed in the process. By the way, the clay I used above is a firm Klean Klay. 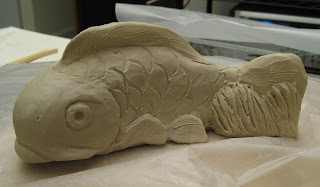 It's the same clay I used while making the model for my bronze bas-relief. I pick this stuff up from Sculpture Depot since it's a short drive away. The nice thing about this clay is you can work it easily, but it holds form very well. The down side is that it doesn't harden nor can you "bake" it in any fashion. I have used sculpey in the past, and I may return to it in the future. I mean, the Klean Klay models I've made hold up fine, but if you want to keep the model around for reference, like I do, and not simply make a mold or something out of it, you probably want a more durable form. Anyway, after making the clay model, I of course worked on the stone. I've just noticed that I may have been too close to the sculptures when I took the photos. They appear flatter in the images than the do in life. 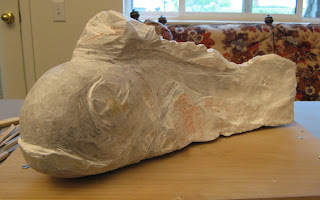 In my humble opinion, the fish form is really taking shape. It has a very pleasing curve at this point. I'm hoping to be able to keep that curve and accentuate it on the concave side. I'm also hoping to be able to accentuate it with a few other touches as I go. I'm struggling a bit on the concave side as the grinder may not be the best tool to work on that side. In fact, the entire sculpture may not be ideal for just the grinder. I guess I'll see as I go.